Dunhill Black is a fragrance for every true gentleman is selected & caressing. 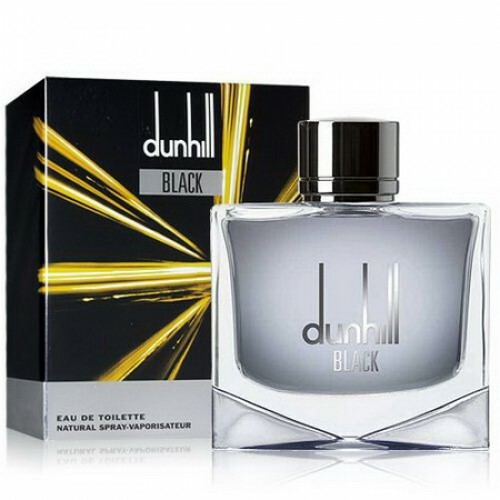 Dunhill Black 100ml. is an Eau de Toilette that marries rugged masculine appeal with a delicate sophisticated charm that makes for a spellbinding fusion. This fragrance is made for the multi-faceted man who strides along nature trails and conference rooms alike. This luxurious scent resonates a strong and aggressive surface that tenaciously lingers above a gentle and intense persona. The woody extracts create an aura fit for a husky, hands-on man who aims to conquer the world on his own terms. A striking top note of nettles that provide a smoky aroma, descend in a light and sweet heart note that combine floral hints of lavender and jasmine. It finishes off with a stronger base note that comprises of antique cedar, a delicate ‘tea-rose’ scent of guaiac wood and distinct suede. The fresh and spicy accords a magnetic attraction that is fitting for any time or any season. Encased in a sleek and sophisticated vial, the distinct and all-encompassing scent embodies an air of intrigue and mystery. Dunhill Black is a woody fragrance, very warm and warm. It has the freshness and briskness, but also softness and smoothness. It combines various characteristics of man and can it so very well capture. It is the scent of a very intimate and personal, that perfectly blends in with every personality. Black Eau de Toilette conceals sharpness and energy nettle stings, if it is not treated very carefully. Its poignancy is not softened by a light jasmine and lavender. This combination creates a so incredibly fresh feeling relaxed and full of energy. In the nose there are also subtle and seductive touch, caressing the wood. Black is a fragrance for every true gentleman is selected and caressing. But it is also full of temperament and charm. Great charisma and underline every mature man. It can also emphasize its pure, masculine sensuality and seduction. This fragrance in itself is hidden unbridled power and roughness, wrapped in an elegant and sleek, black suit.